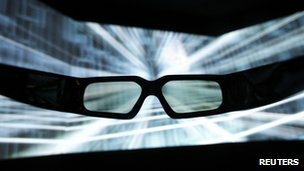 Technology that could lead to the creation of glasses-free 3D films at cinemas has been developed by researchers in South Korea. It uses a barrier with slats so that when a viewer looks at the screen each of their eyes sees the image differently. As a result their brain creates an illusion of depth. TV makers have tried to use a similar approach, but require viewers to be in a particular spot to see a 3D image. This would not be possible in a cinema where the audience needs to be able to watch the screen from a wide variety of angles. The study was carried out at Seoul National University and appears in the journal Optics Express. "This new method seems to be a viable one for providing glasses-free 3D environment with front-projection technology - instead of using multiple projectors, it only uses one," said Prof John Koshel from the College of Optical Sciences at the University of Arizona, who edited the study for publication. He explained that the standard way to create 3D-images on a movie screen was to use stereoscopy: the technique involves projecting two 2D-images through a special filter. To the naked eye the two offset versions of the footage appear to be superimposed over each other. But if the viewer wears polarised glasses the left lens only lets in one of the images, and the right lens the other, creating a sense of depth. 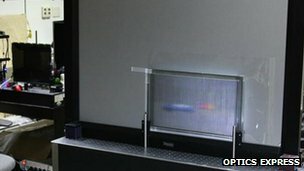 To go glasses-free TV makers have used a different technique involving what is known as a "parallax barrier". This involves placing a barrier in front of the image source which has slats in it similar to those of Venetian blind. These slats are angled so that light from one set of the TV screen's pixels shines through and is directed to one of the viewer's eye, and light from another set is shown to the other eye - with no overlap. But this only provides a 3D-effect if the watcher is sitting in a specific spot. Manufacturers have created televisions showing several pairs of images - allowing a single screen to support several family members sitting in specific positions. But they cannot support the dozens - or even hundreds - of people sitting in a cinema at the same time. The South Korean team mimicked this technique, but adapted it to support a much wider variety of viewing angles. They did this by creating the slat-effect using polarisers - similar to those used in the lenses of 3D cinema glasses. Their screen was also covered with a special coating, and this combined with their adapated barrier produced many pairs of images - enough in theory to accommodate a cinema audience. The lead scientist Byoungho Lee, professor at Seoul National University, said that more research was necessary, but the technology "might constitute a simple, compact, and cost-effective approach to producing widely available 3D cinema, while also eliminating the need for wearing polarising glasses".